The XB-29 is a pre-production version of the B-29 bomber. February 18, 1943 the second prototype of the XB-29 (41-003) was to make another flight. At 10:40, the crew proceeded with the standard inspection of the aircraft. Edmund Allen took the place of the first pilot, Robert Dansfield was the second pilot, Fritz Moi was a flight mechanic, Robert Maxfield was a mechanic, Barlkey Henshaw was a recording camera operator and Barlkey. In addition, on board the aircraft were aerodynamic Vincent North and four engineers: Raymond Beizel, Charles Blaine, Thomas Lankford and Edward Wersby. The plane broke away from the runway around 12:11 and quickly gained 1524 m. At 12:16 a fire broke out in the engine nacelle No. 1. Allen immediately shut off the fuel supply to the engine and turned its propeller into autorotation mode. Moi closed the air intake louvers and sent carbon dioxide into the engine compartment. At 12:21 pm, Allan reported the incident to the airfield, requested permission for an emergency landing. At 12:24 the plane flew at an altitude of 460 meters above the Lake Washington Bridge. One of the crew warned Allen that the fire engulfed the entire left wing of the aircraft. At that moment, when flames burst into the fuselage, the radio operator Harry Rolston left the car. As he fell, he struck a power line wire. Rolston died on the spot, de-energizing the entire southern part of Seattle. Engineer Edward Wersby jumped with a parachute a minute later. But he did not have enough height to open the parachute. Five minutes later, the plane crashed into a five-story shop of the Fry & Co. canned meat factory. 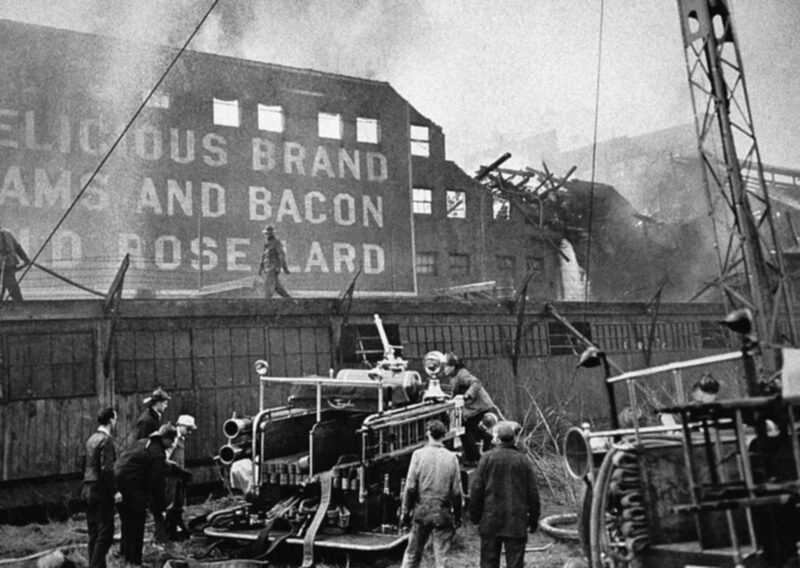 The entire crew (11 people) died, as well as 19 people who were in the workshop and one guard who tried to put out the fire with improvised means. An investigation into the crash revealed that the main cause was the low reliability of the Wright Cyclone engines. Hastily engineered engines were prone to overheating cylinder heads, which, in turn, disrupted the valves. Problems with the R-3350 engines continued throughout 1943 and most of 1944.